We understand that this can be difficult for pet owners to label as stress or illness, as many of these symptoms are also linked to feline diseases. If your cat has issues with any of these, make sure to bring them to a veterinarian first to rule out illnesses. Any significant change to the environment can stress out a cat. Have you recently moved homes? Is there a new pet in the home, or perhaps a loss of an older pet? Do you have company in town? Even the most laid-back of cats can experience stress, which can manifest itself in a variety of symptoms. There are a few ways to help eliminate stress, even if you don’t know the source. Even small and seemingly-mundane things can irritate a cat, so keep that in mind. This includes loud music or even traffic noises from outdoors. Here are some suggestions to help with the stress. Several cats in one home: If you have more than one cat, this can take some creativity. Finding a space for each cat to retreat to away from other cats, people, and pets can help them have the space they need to relax. You should also have at least one litter box per cat, but an extra one or two is also good. Offer them their food separately with the dishes in different places, or at least with the cats apart from one another. That will allow them to eat in peace and not worry about the other cat trying to take their food. Several pets in one home: Even if you only have one cat, the combination of one cat and several other pets can be very stressful to your cat. You will want to have a space set aside where the other animals cannot access. A tall cat tree is a great choice, as most dogs are not climbers. Offering a variety of toys can also be helpful as a distraction for each pet, so they are less likely to worry about each other. If you are going a vacation or a long time away, you may want to consider a live-in catsitter or a boarding facility so the cat is less stressed about your time away or worried for your return. If you have a new baby or any guests in your home that were not there previously, try your best to give the cat a slow introduction. Also, this is when a safe space for your cat is crucial. They can go there when they are overwhelmed or frightened. 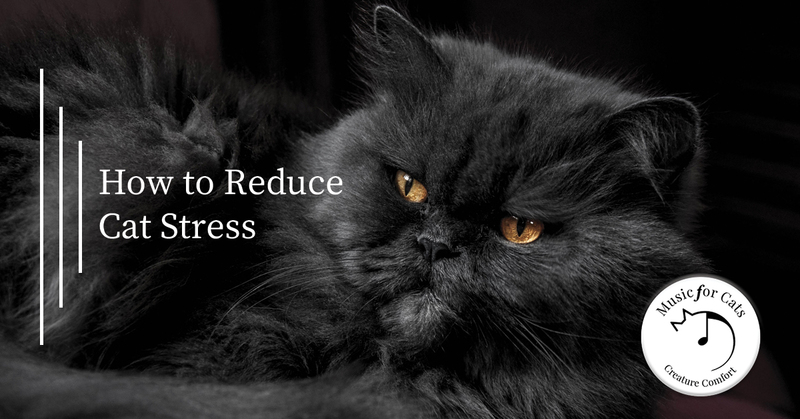 In the end, cats just need kind and considerate care when it comes to handling their stress. We know that new family members, be they other pets or children, are not avoidable in many cases. Your cat will grow to be comfortable, but it might take time. At Music for Cats, we know that cats have specific preferences when it comes to the sounds they prefer and how they respond to stimuli around them. That’s why we created our album, filled with purring sounds, suckling noises, bird chirps, and other musical combinations that cats respond to. The cats who have listened to it tend to relax and rub on the speakers, indicating ownership. If you would like to experience this phenomenon yourself and see our natural cat calming music in action, shop today! We have several options of albums that are timed out for your needs. These range from playing all the current songs in a row to having them be spread out for extended listening while you are away from home. Reach out now if you have any questions!